The Husky Gold tomato is popular for its beautiful gold color and because it is compact growing, is often chosen as a patio or container variety. 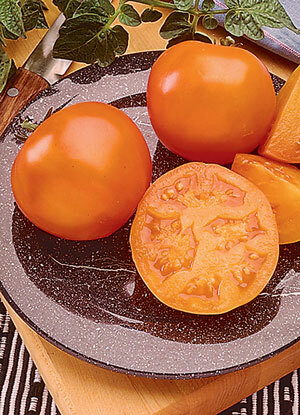 Growing award winning varieties always improves your chances for success, and the Husky Gold hybrid tomato was the winner of the 1993 All-America Selections award. It is resistant to cracking, verticillium and fusarium wilts. The designation F1-Hybrid tells you this variety has been cross-produced from two distinct "pure" tomatoes. Because 'Husky Gold' is an F1, or first-generation hybrid, it should have better-than-average vigor and give more uniform and bigger yields. But if you save seeds for next year you'll probably not recognize, or like, the tomatoes produced. These golden tomatoes are medium-sized. The flavor is sweet and mild. The vines are dwarf indeterminates and bear fruit all season but because they are compact don't usually require staking. Combining the best of both indeterminate (tall continual growth) and determinate (short bushy) plants is the dwarf indeterminate (or ISI, for indeterminate short-internode). This type produces all season but remains a compact size. Husky Gold hybrid tomatoes are vigorous and easy to grow from seedlings purchased at your garden center or grow from seed indoors. They can be planted outdoors when the soil warms. Recommended safe planting dates can be found in when to plant tomatoes.